On August 20, 1920, a meeting was held by representatives of the Akron Pros, Canton Bulldogs, Cleveland Indians, Rock Island Independents and Dayton Triangles at the Jordan and Hupmobile auto showroom in Canton, Ohio. 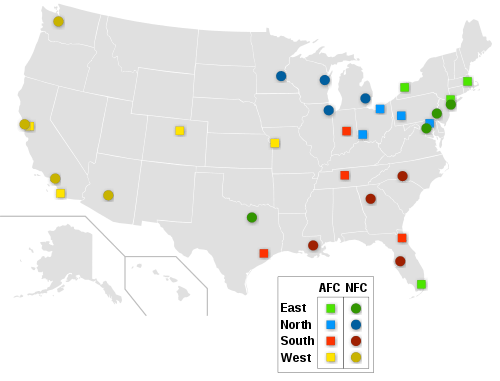 This meeting resulted in the formation of the American Professional Football Conference (APFC), a group who, according to the Canton Evening Repository, intended to "raise the standard of professional football in every way possible, to eliminate bidding for players between rival clubs and to secure cooperation in the formation of schedules". Another meeting held on September 17, 1920 resulted in the renaming of the league to the American Professional Football Association (APFA). The league hired Jim Thorpe as its first president, and consisted of 14 teams. Only two of these teams, the Decatur Staleys (now the Chicago Bears) and the Chicago Cardinals (now the Arizona Cardinals), remain. Although the league did not maintain official standings for its 1920 inaugural season and teams played schedules that included non-league opponents, the APFA awarded the Akron Pros the championship by virtue of their 8–0–3 (8 wins, 0 losses, and 3 ties) record. The first event occurred on September 26, 1920 when the Rock Island Independents defeated the non-league St. Paul Ideals 48-0 at Douglas Park. On October 3, 1920, the first full week of league play occurred. The following season resulted in the Chicago Staleys controversially winning the title over the Buffalo All-Americans. In 1922, the APFA changed its name to the National Football League (NFL). In 1932, the season ended with the Chicago Bears (6-1-6) and the Portsmouth Spartans (6-1-4) tied for first in the league standings. At the time, teams were ranked on a single table and the team with the highest winning percentage (not including ties, which were not counted towards the standings) at the end of the season was declared the champion; the only tiebreaker was that in the event of a tie, if two teams played twice in a season, the result of the second game determined the title (the source of the 1921 controversy). This method had been used since the league's creation in 1920, but no situation had been encountered where two teams were tied for first. The league quickly determined that a playoff game between Chicago and Portsmouth was needed to decide the league's champion. The teams were originally scheduled to play the playoff game, officially a regular season game that would count towards the regular season standings, at Wrigley Field in Chicago, but a combination of heavy snow and extreme cold forced the game to be moved indoors to Chicago Stadium, which did not have a regulation-size football field. Playing with altered rules to accommodate the smaller playing field, the Bears won the game 9-0 and thus won the championship. Fan interest in the de facto championship game led the NFL, beginning in 1933, to split into two divisions with a championship game to be played between the division champions. The 1934 season also marked the first of 12 seasons in which African Americans were absent from the league. The de facto ban was rescinded in 1946, following public pressure and coinciding with the removal of a similar ban in Major League Baseball. Today, the NFL is considered the most popular sports league in North America; much of its growth is attributed to former Commissioner Pete Rozelle, who led the league from 1960 to 1989. Overall annual attendance increased from three million at the beginning of his tenure to seventeen million by the end of his tenure, and 400 million viewers watched 1989's Super Bowl XXIII. The NFL established NFL Properties in 1963. The league's licensing wing, NFL Properties earns the league billions of dollars annually; Rozelle's tenure also marked the creation of NFL Charities and a national partnership with United Way. Paul Tagliabue was elected as commissioner to succeed Rozelle; his seventeen-year tenure, which ended in 2006, was marked by large increases in television contracts and the addition of four expansion teams, as well as the introduction of league initiatives to increase the number of minorities in league and team management roles. 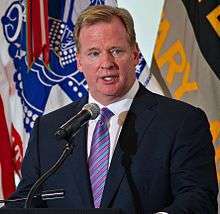 The league's current Commissioner, Roger Goodell, has focused on reducing the number of illegal hits and making the sport safer, mainly through fining or suspending players who break rules. These actions are among many the NFL is taking to reduce concussions and improve player safety. The NFL gave up the tax exempt status in 2015 following public criticism; in a letter to the club owners, Commissioner Roger Goodell labeled it a "distraction", saying "the effects of the tax exempt status of the league office have been mischaracterized repeatedly in recent years... Every dollar of income generated through television rights fees, licensing agreements, sponsorships, ticket sales, and other means is earned by the 32 clubs and is taxable there. This will remain the case even when the league office and Management Council file returns as taxable entities, and the change in filing status will make no material difference to our business". As a result, the league office might owe around US$10 million in income taxes, but it is no longer required to disclose the salaries of its executive officers. Each NFL club is granted a franchise, the league's authorization for the team to operate in its home city. This franchise covers 'Home Territory' (the 75 miles surrounding the city limits, or, if the team is within 100 miles of another league city, half the distance between the two cities) and 'Home Marketing Area' (Home Territory plus the rest of the state the club operates in, as well as the area the team operates its training camp in for the duration of the camp). Each NFL member has the exclusive right to host professional football games inside its Home Territory and the exclusive right to advertise, promote, and host events in its Home Marketing Area. There are several exceptions to this rule, mostly relating to teams with close proximity to each other: the San Francisco 49ers and Oakland Raiders only have exclusive rights in their cities and share rights outside of it; and teams that operate in the same city (e.g. New York Giants and New York Jets) or the same state (e.g. California, Florida, and Texas) share the rights to the city's Home Territory and the state's Home Marketing Area, respectively. Every NFL team is based in the contiguous United States. Although no team is based in a foreign country, the Jacksonville Jaguars began playing one home game a year at Wembley Stadium in London, England in 2013 as part of the NFL International Series. The Jaguars' agreement with Wembley was originally set to expire in 2016, but has since been extended through 2020. The Buffalo Bills played one home game every season at Rogers Centre in Toronto, Canada as part of the Bills Toronto Series from 2008 to 2013. Mexico also hosted an NFL regular-season game, a 2005 game between the San Francisco 49ers and Arizona Cardinals known as "Fútbol Americano", and 39 international preseason games were played from 1986 to 2005 as part of the American Bowl series. The Raiders and Houston Texans played a game in Mexico City at Estadio Azteca on November 21, 2016. According to Forbes, the Dallas Cowboys, at approximately US $4 billion, are the most valuable NFL franchise and the most valuable sports team in the world. Also, all 32 NFL teams rank among the Top 50 most valuable sports teams in the world; and 14 of the NFL's owners are listed on the Forbes 400, the most of any sports league or organization. In addition to the regional games, the league also has packages of telecasts, mostly in prime time, that are carried nationwide. CBS also carries a package of five games on Thursday nights. NBC broadcasts the primetime Sunday Night Football package and seven Thursday night games, which includes the NFL Kickoff game that starts the regular season and a primetime Thanksgiving Day game. ESPN carries all Monday Night Football games. The NFL's own network, NFL Network, carries all Thursday Night Football games, including those on CBS and NBC (except the Thanksgiving and kickoff games, which remain exclusive to NBC). The Super Bowl television rights are rotated on a three-year basis between CBS, Fox, and NBC. In 2011, all four stations signed new nine-year contracts with the NFL, each running until 2022; CBS, Fox, and NBC are estimated by Forbes to pay a combined total of US$3 billion a year, while ESPN will pay US$1.9 billion a year. The league also has deals with Spanish-language broadcasters NBC Universo, Fox Deportes and ESPN Deportes, which air Spanish language dubs of their respective English-language sister networks' games. The league's contracts do not cover preseason games, which individual teams are free to sell to local stations directly; a minority of preseason games are distributed among the league's national television partners. Each April (excluding 2014 when it took place in May), the NFL holds a draft of college players. The draft consists of seven rounds, with each of the 32 clubs getting one pick in each round. The draft order for non-playoff teams is determined by regular-season record; among playoff teams, teams are first ranked by the furthest round of the playoffs they reached, and then are ranked by regular-season record. For example, any team that reached the divisional round will be given a higher pick than any team that reached the conference championships, but will be given a lower pick than any team that did not make the divisional round. The Super Bowl champion always drafts last, and the runner-up always drafts next-to-last. All potential draftees must be at least three years removed from high school in order to be eligible for the draft. Underclassmen that have met that criterion to be eligible for the draft must write an application to the NFL by January 15 renouncing their remaining college eligibility. Clubs can trade away picks for future draft picks, but cannot trade the rights to players they have selected in previous drafts. Like the other major sports leagues in the United States, the NFL maintains protocol for a disaster draft. In the event of a 'near disaster' (less than 15 players killed or disabled) that caused the club to lose a quarterback, they could draft one from a team with at least three quarterbacks. In the event of a 'disaster' (15 or more players killed or disabled) that results in a club's season being cancelled, a restocking draft would be held. Neither of these protocols has ever had to be implemented. Clubs also have the option to use a transition tag, which is similar to the non-exclusive franchise tag but offers no compensation if the former club refuses to match the offer. Due to that stipulation, the transition tag is rarely used, even with the removal of the "poison pill" strategy (offering a contract with stipulations that the former club would be unable to match) that essentially ended the usage of the tag league-wide. Each club is subject to a salary cap, which is set at US$143.28 million for the 2015 season, US$10 million more than in 2014 and US$20 million more than in 2013. 1 2 The New York Jets and New York Giants share MetLife Stadium. 1 2 The Baltimore Ravens were originally the Cleveland Browns, and moved to Baltimore in 1996. Due to an agreement with the city of Cleveland that allowed the club to move, the Browns name, colors, and team history/records were left for a new Cleveland Browns team while the team, personnel, and staff of the old Browns team were allowed to move to Baltimore. As such, the Ravens are considered to have begun play in 1996 while the current Cleveland Browns are considered to have been founded in 1950, became inactive from 1996 to 1998, and resumed play as new team in 1999. ↑ The Jaguars began playing one home game each season at Wembley Stadium in London, England in 2013, and will continue to do so through 2020. ↑ The Rams will play at Los Angeles Memorial Coliseum from 2016–2018 until the Los Angeles Entertainment Center in Inglewood, California, has finished construction for the 2019 NFL season. 1 2 "History: NFL Champions". Pro Football Hall of Fame. Retrieved January 30, 2013. ↑ "NFL is world's best attended pro sports league". ABS-CBN News. Agence France-Presse. January 6, 2013. Retrieved January 30, 2013. ↑ "Pro Football is Still America's Favorite Sport". Harris Interactive. January 26, 2016. Retrieved June 11, 2016. 1 2 "Happy Birthday NFL?" (PDF). The Coffin Corner. Professional Football Researchers Association. 2 (8). 1980. Retrieved February 7, 2013. ↑ "National Football League (NFL)". Encyclopædia Britannica. Retrieved June 21, 2013. ↑ Snyder, Gib (January 6, 2012). "Buffalo: A city cursed with bad sports luck". The Observer. Ogden Newspapers. Retrieved January 16, 2013. ↑ "Sept. 17, 1920 – The Founding of the NFL". Pro Football Hall of Fame. Retrieved July 9, 2012. ↑ Carroll, Bob. "The 60-Yard Circus" (PDF). Professional Football Researchers Association. Retrieved February 9, 2013. ↑ Finkelman, Paul, ed. (February 2, 2009). Encyclopedia of African American History, 1896 to the Present: From the Age of Segregation to the Twenty-first Century. 1. Oxford University Press. p. 235. ISBN 978-0195167795. Retrieved June 21, 2013. ↑ Cross, B. Duane (January 22, 2001). "Off-the-field competition yields game-changing merger". CNNSI. Retrieved February 15, 2013. 1 2 "History: 1961-1970". NFL. Retrieved February 14, 2013. ↑ Bartlett, Roger; Gratton, Chris; Rolf, Christer, eds. (October 26, 2009). Encyclopedia of International Sports Studies. Routledge. pp. 932–933. ISBN 978-0415561471. Retrieved June 21, 2013. ↑ Evans, Thayer (February 2, 2008). "The Legacy of Tagliabue?". The New York Times. Retrieved June 27, 2013. ↑ Lapchick, Richard (August 17, 2006). "Report Card: Tagliabue's legacy includes new model for racial hiring". ESPN.com. Retrieved June 27, 2013. ↑ Taylor, Jean-Jacques. "Roger Goodell's authority takes a hit". ESPN.com. Retrieved December 13, 2012. ↑ Brady, Erik; Gary Mihoces (September 16, 2013). "Violent hits keep coming, so is NFL changing culture?". USA Today. Retrieved September 22, 2013. ↑ "NFL Regular Season Games Played per Season". Pro Football Hall of Fame. Retrieved February 13, 2013. 1 2 3 Maske, Mark (August 29, 2013). "NFL preseason is long and often meaningless but a solution isn't apparent to league, players". The Washington Post. Retrieved August 28, 2013. ↑ "Lady Luck and the Lombardi legend". Cold Hard Football Facts. Football Nation. October 12, 2005. Retrieved February 14, 2013. ↑ "History of the Wild Card". Pro Football Hall of Fame. Retrieved February 14, 2013. ↑ Wilson, Doug (August 11, 2008). "N.F.L. Executives Hope to Keep Salaries Secret". The New York Times. Retrieved February 2, 2013. ↑ Schrotenboer, Brent (May 30, 2013). "To tax or not? The NFL's relationship with the IRS". USA Today. Retrieved January 30, 2013. ↑ "Community: Shareholders". Green Bay Packers. Retrieved November 21, 2013. Green Bay Packers Inc., has been a publicly owned, nonprofit corporation since Aug. 18, 1923, when original articles of incorporation were filed with Wisconsin's secretary of state. ↑ "NFL targeted by Oklahoma senator for 'not-for-profit' tax status". Sports Illustrated. March 5, 2012. Retrieved February 2, 2013. ↑ Myers, Gary (April 18, 2015). "NFL no longer non-profit after giving up tax exempt status". New York Daily News. Retrieved June 25, 2015. ↑ NFL Bylaws, p. 26-27. 1 2 3 4 5 NFL Bylaws, p. 28-35. ↑ Maske, Mark (August 9, 2006). "Owners Pick Goodell as NFL Commissioner". The Washington Post. Retrieved February 2, 2013. ↑ Smith, Michael David (July 22, 2011). "NFL drops third quarterback rule, 46 active players on game day". NBC Sports. Retrieved February 1, 2013. 1 2 Pengelly, Martin (August 21, 2012). "Jacksonville Jaguars to play four NFL 'home' games at Wembley". The Guardian. London. Retrieved February 1, 2013. 1 2 "NFL, Jaguars extend agreement to play at Wembley through 2020" (Press release). National Football League. October 22, 2015. Retrieved November 24, 2016. ↑ "History to be made in Mexico City". NFL. September 28, 2005. Archived from the original on June 25, 2006. Retrieved February 1, 2013. ↑ "Back to Mexico: Texans-Raiders to play Nov. 21 in Mexico City". NFL.com. Retrieved 2016-02-06. 1 2 "Teams". Pro Football Hall of Fame. Retrieved February 1, 2013. 1 2 "History of NFL franchises, 1920-present". Pro Football Hall of Fame. Retrieved February 1, 2013. ↑ Kurzweil, Anthony (January 18, 2016). "Los Angeles Rams to Take Season Ticket Deposits Beginning Monday". KTLA.com. KTLA. Retrieved January 18, 2016. ↑ "NFL/Hall of Fame Game". Pro Football Hall of Fame. Retrieved February 4, 2013. ↑ Bowen, Matt (August 29, 2012). "Exhibition finale biggest game of year for players on bubble". The Chicago Tribune. Retrieved February 4, 2013. 1 2 Smith, Michael David Smith (August 14, 2013). "Jim Irsay to fans: You don't really pay full price for preseason tickets". Pro Football Talk. NBC Sports. Retrieved September 18, 2013. ↑ Issacson, Melissa (December 25, 2005). "Ghost of Christmas past: Sports-free TV". The Chicago Tribune. Retrieved February 6, 2013. 1 2 "2012 NFL Schedule Announced". NFL Communications. April 17, 2012. Retrieved February 4, 2013. ↑ Sensei, Andrew. "Sports Law". Tulane University Law School. Retrieved February 4, 2013. ↑ "Blizzard forces postponement of Vikes-Eagles game to Tuesday". NFL. December 26, 2010. Retrieved February 4, 2013. ↑ "NFL season opener to be held Wednesday, Sept. 5". NFL. February 28, 2012. Retrieved February 4, 2013. ↑ "Realignment for 2002". NFL. Retrieved February 4, 2013. ↑ Florio, Mike (November 8, 2011). "Unusual bye format traces to lockout". Pro Football Talk. NBC Sports. Retrieved February 4, 2013. ↑ Ourand, John (April 26, 2010). "NFL schedule navigated World Series, other conflicts". Sports Business Daily. Retrieved February 4, 2013. ↑ "Tie-breaking procedures". NFL. Retrieved February 4, 2013. ↑ "Pro Bowl set for Jan. 27 in Honolulu, week before Super Bowl". NFL. May 30, 2012. Retrieved February 4, 2013. ↑ Price, Mark J. (April 25, 2011). "Local history: Searching for lost trophy". Akron Beacon Journal. Retrieved February 5, 2013. ↑ Terl, Matt (July 28, 2008). "Inside Redskins Park: The Other Championship Trophy". Official Redskins Blog. Retrieved February 5, 2013. ↑ Horovitz, Bruce (January 30, 2002). "Football's super prize reaches icon status". USA Today. Retrieved February 5, 2013. ↑ "45 Years of Super Bowl Rings". ESPN.com. Retrieved February 5, 2013. ↑ Neel, Eric. "Super Bowl from A to Z". ESPN.com. Retrieved June 8, 2013. ↑ Jensen, Sean. "NFC's Halas trophy has new look". Chicago Sun-Times. Retrieved February 5, 2013. ↑ Tafur, Vic (January 26, 2013). "O.J. Brigance inspires Ravens". San Francisco Chronicle. Retrieved February 5, 2013. ↑ Pollak, Austin (June 14, 2012). "Patriots Receive AFC Championship Rings From Owner Robert Kraft". New England Sports Network. Retrieved February 5, 2013. ↑ "Seahawks receive NFC championship rings". ESPN.com. June 7, 2006. Retrieved February 5, 2013. ↑ Klis, Mike (February 2, 2013). "MVP in NFL: Peyton Manning or Adrian Peterson, it's a two-horse race". The Denver Post. Retrieved February 16, 2013. ↑ "NFL Honors". NFL. Retrieved February 16, 2013. ↑ Watkins, Calvin (February 2, 2013). "Jason Witten wins Walter Payton NFL Man of the Year award". ESPN.com. Retrieved February 16, 2013. ↑ Brinson, Will (February 2, 2013). "Bruce Arians wins 2012 Coach of the Year Award". CBS Sports. Retrieved February 16, 2013. ↑ "Peyton Manning and Adrian Peterson named 2012 FedEx Air & Ground NFL Players of the Year at '2nd Annual NFL Honors'". NFL. Retrieved February 17, 2013. ↑ "Seattle Seahawks QB Russell Wilson named 2012 Pepsi MAX NFL Rookie of the Year". NFL. Retrieved February 17, 2013. 1 2 3 "The tradition continues: NFL to remain on broadcast TV". NFL. December 14, 2011. Retrieved February 5, 2013. ↑ Florio, Mike (December 1, 2011). "Flexible schedule flexes Broncos-Vikings from CBS to FOX". Pro Football Talk. NBC Sports. Retrieved February 5, 2013. ↑ Fixmer, Andy (November 29, 2012). "Thursday Night Football Scores Big for the NFL". Bloomberg Businessweek. Retrieved February 5, 2013. ↑ Badenhausen, Kurt (December 14, 2011). "The NFL Signs TV Deals Worth $27 Billion". Forbes. Retrieved February 6, 2013. ↑ Molloy, Tim (August 30, 2011). "Telemundo Extends Deal With NFL Through 2013". Reuters. Retrieved February 6, 2013. ↑ Kirkendall, Josh (September 8, 2011). "NFL And ESPN Reach Major Media Rights Deal". Cincy Jungle. SB Nation. Retrieved February 6, 2013. ↑ "NFL eases local TV blackout restrictions for upcoming season". NFL. June 30, 2012. Retrieved February 6, 2013. 1 2 "NFL to suspend TV blackout policy". ESPN.com. March 24, 2015. Retrieved March 24, 2015. ↑ "NFL 2012 TV Recap". NFL Communications. January 3, 2003. Retrieved February 6, 2013. ↑ Bibel, Sara (February 4, 2014). "Sunday Final Ratings: 'New Girl' & 'Brooklyn Nine Nine' Adjusted Up & Final Super Bowl Numbers (Updated)". Zap2it. Retrieved February 11, 2014. ↑ "NFL and Dial Global Agree on New Multi-Year Extension". Dial Global. September 19, 2012. Retrieved February 6, 2013. ↑ Cone, Lawrence L. (October 1985). "Skycam: An Aerial Robotic Camera System". BYTE. p. 122. Retrieved 2 April 2016. ↑ "NFL and Yahoo! partner to deliver first-ever global live stream" (Press release). National Football League. June 3, 2015. Retrieved July 24, 2015. ↑ Schwab, Frank (June 3, 2015). "Yahoo will broadcast first free global live stream of NFL game". Yahoo! Sports. Retrieved July 24, 2015. ↑ Clark, Kevin (March 23, 2015). "NFL to Broadcast a Game Nationally Via Internet Only". The Wall Street Journal. Retrieved March 24, 2015. ↑ Maggie Penman (January 14, 2015). "Ads Say 'No More' To Domestic Violence, But Will Audience Listen?". NPR. Retrieved 26 June 2015. 1 2 Love, Tim (April 23, 2009). "What's the NFL draft all about?". BBC Sport. Retrieved February 11, 2013. ↑ "Complete order of first round of 2011 NFL Draft determined". NFL. March 27, 2012. Retrieved February 11, 2013. ↑ Smith, Michael David (January 1, 2013). "NFL draft rules a bad deal for Jadeveon Clowney". Pro Football Talk. NBC Sports. Retrieved February 11, 2013. ↑ "NFL officially grants draft eligibility to 65 underclassmen". NFL. January 19, 2012. Retrieved February 11, 2013. ↑ Schrager, Peter (March 31, 2011). "Addressing NFL draft trade rules, times". Fox Sports. Retrieved February 11, 2013. ↑ Aiello, Greg; McCarthy, Brian; Signora, Michael (March 26, 2012). "NFL Announces 32 Compensatory Draft Choices to 15 Clubs" (PDF). NFL Labor. Retrieved February 11, 2013. ↑ Black, James C. (May 29, 2003). "Offseason overview: Minnesota Vikings". ESPN.com. Retrieved February 11, 2013. ↑ Flatter, Ron (March 9, 2006). "Bo knows stardom and disappointment". ESPN.com. Retrieved February 11, 2013. ↑ Badenhausen, Kurt (April 24, 2012). "NFL Draft Picks More Valuable Than Ever Under New System". Forbes. Retrieved February 11, 2013. ↑ Jeremiah, Daniel (July 11, 2012). "Supplemental draft primer: Josh Gordon has NFL teams buzzing". NFL. Retrieved February 11, 2013. ↑ Schefter, Adam (August 15, 2011). "Terrelle Pryor remains in draft limbo". ESPN.com. Retrieved February 11, 2013. ↑ "Building Block". ESPN.com. February 12, 2002. Retrieved February 11, 2013. ↑ "Allocation Draft" (PDF). Professional Football Researchers Association. Retrieved February 11, 2013. ↑ "1984 Supplemental Draft". Pro Football Hall of Fame. Retrieved February 11, 2013. ↑ Drehs, Wayne (April 10, 2001). "'God forbid it should ever be needed'". ESPN.com. Retrieved February 11, 2013. 1 2 "Questions and answers for 2012 free agency". NFL. March 11, 2012. Retrieved February 16, 2013. ↑ Reynolds, Neil (February 16, 2012). "NFL Explained: The Franchise Tag". NFLUK. Retrieved February 16, 2013. ↑ Nogle, Kevin (December 28, 2012). "NFL Franchise Tags and the Miami Dolphins". The Phinsider. SB Nation. Retrieved February 16, 2013. ↑ Breer, Albert (February 23, 2012). "New wrinkles to franchise tag, salary cap happened for reason". NFL. Retrieved February 16, 2013. ↑ Myers, Keith (February 16, 2008). "The Poison Pill is dead". 12th Man Rising. SI.com. Retrieved February 16, 2013. ↑ Patra, Kevin (March 2, 2015). "NFL salary cap will be $143.28 million in 2015". National Football League. Retrieved June 25, 2015. "Constitution and Bylaws of the National Football League" (PDF). 2006. Archived from the original on March 26, 2014. Retrieved February 2, 2013. "2013 Official Playing Rules of the National Football League" (PDF). National Football League. 2013. Archived from the original on March 26, 2014. Retrieved March 26, 2014. "2011-20 NFL/NFLPA Collective Bargaining Agreement" (PDF). National Football League. August 4, 2011. Archived from the original on March 26, 2014. Retrieved March 26, 2014.